Procurement of Refurbished and New Diesel railcars. You are procuring improved carriages, I ask that you get them so that the doors in a limited number of carriages can be opened at short platform stations. These are normal in most other commuter railways but the IR carriages must open all doors on the train which means 8 carriages cannot be used on lines with short platforms (Kilcoole & Rathdrum for example). 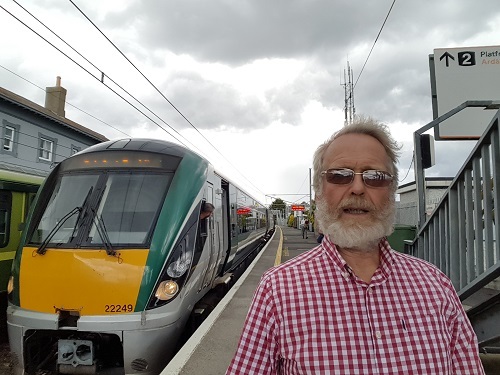 This will improve the service to Greystones and Wicklow by allowing longer 8 carriage trains in place of the 4 (sometimes 3) carriage ones used for the rush hour diesel services (6.54 & 7.51 ex Greystones). The latter is standing room only from Wicklow and revised carriages can provide a better service to Greystones and Kilcoole. Greystones is the 5th busiest suburban station even though there are only a third of DARTS compared to the other stations. This results in the 7.30, 8.00 and 8.30 being crowded. I believe the 8.00 is the busiest train in the country and a longer preceding diesel would relieve pressure. Hence the importance of extra carriages on the diesels. There is also space in the timetable to run an extra DART at 7.21, by running it down early, even with the present track and signalling system. I would ask that the carriage order provides for this if extra carriages are needed. The Council has provided the largest Park n’ Ride site (450+ spaces) and largest bike parking (90 spaces) of any DART Station. I am keen to expand these but there needs to be a commitment from IR to improve the service. The limited number of trains produces a peak load and long queues to get off the platform, out of the station and out of the Park n’ Ride which should be addressed by more trains, as mentioned, and station modifications. Cycle parking inside the station could also be accommodated. The future ‘10 minute’ DART service is billed as an improvement. For Greystones you are planning a worse service with no extra trains and a 5.5 minute increase in journey time (12% increase). This will encourage people to use cars in conflict with sustainable development. The Development targets handed down to the Council are for an extra 4,000 houses in Greystones and many more in Newtown and Wicklow Town and a better transport offering is required for this.